The online master's in communication degree is often sought after by professionals who have been working in or near the communications field for a while and have a specific career path in mind, as well as those who choose to enter the program immediately upon graduating with a bachelor's degree. Either way, students in an online master's in communication program can expect to take several high-level courses that will prepare them for meaningful work in the communications field. 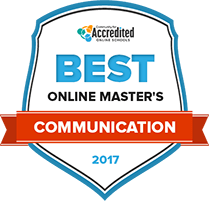 Read on to learn more about what students can gain from earning an online master's in communication degree. Earning an online master’s in communication degree can be the ticket to a variety of promising career paths. With so many online programs available, finding the right program can be tricky. Our rankings focus on important criteria to consider when making this important decision: graduation rates, tuition costs and teacher-student ratio. These rankings can help aspiring communication students narrow down options to create a shorter, more manageable list. The school of communication at Northwestern University puts a heavy emphasis on the performing arts on the creative process behind them. Students who want to pursue a career in theater, film, television or similar will find the curriculum in a communication degree at Northwestern will prepare them for the field. A master’s in communication will prepare students to think creatively, and Northwestern helps students get connected with internships and careers after graduation. Also, Northwestern gives students hands-on experience through many different projects, better preparing them for whatever profession they might be interested in. The University of Southern California’s master’s program in communication prepares students to step into professional roles. A communication degree at USC typically entails studying business-related communication subjects, and the curriculum is structured to teach students to become leaders in the business field of communications. The master’s program for a degree in communication can be taken entirely online, giving students the freedom to continue with their career while also furthering their knowledge in the field. Students will also study communication theory which they will then be able to apply themselves, giving them a more comprehensive understanding of communication in global business. Communications goes hand in hand with marketing at the University of Denver. Students who decide to study communications at the University of Denver have the option to focus on one of their programs. Each of their programs is meant to prepare students for the modern age of communication. Social media and digital marketing are a few of the fields that students will study, along with more normalized communication courses. While studying and pursuing their master’s degree in communication, students will also have the opportunity to get real-world experience by practicing their studies in the field. Individuals looking to get their master of arts in communication studies may consider enrolling in Webster University’s curricula. In order to advance their own specialized interests, students are able to choose from various areas of communication emphasis including media literacy, educational technology and language arts. Courses are offered both in-person and through online programs. Graduates of the program will be well-equipped to further their professions, research and other opportunities. Webster seeks to educate students through their comprehensive academics, student-oriented environments with small class sizes, and networking for over 17,000 peers and professionals across the globe. A master’s degree in communication from Queens University of Charlotte can be completed entirely online, allowing professional, working adults the ability to grow their careers with an advanced degree. The progressive curriculum teaches students how to analyze information and to use practical strategies to leverage traditional and digital media. The program links theory and practice to prepare graduates for a changing professional environment. A capstone project is an applied project that is designed to affect change in their current work environment. Queens uses MyCourses as its online learning environment, where students share blogs, communicate via Skype and have access to instant messaging to interact with peers and professors. Graduates of Canisius College’s master’s in communication and leadership walk away with inspiration and education that helps to develop a unique leadership style. Students can participate in group service projects and graduate assistantships that help to round out their coursework, where they learn to persuade, manage conflicts, collaborate and build relationships with peers and others. Students can attend class in the evening and on weekends so they can continue to work full time throughout their program. Extended learning opportunities include a capstone project and presentation and networking opportunities. At Arizona State University, students learn cutting-edge practices in the master of arts in communication studies program. Students can tailor the program to meet their personal and professional needs as they theorize and explore how individuals and collective groups build relationships and communicate with one another. Students may accelerate their degree in partnership with another program within the college. Many graduates go on to doctoral work or to advanced careers in public relations, community relations and employee development. This master’s program is only available at ASU’s West campus. Individuals who are interested in entering or advancing in the communication related field may benefit from West Virginia University’s master in communication studies program. This degree program is designed to equip students to develop their professional skills including writing, analytical and research skills in order to meet their specialized goals. This 36 credit-hour program is typically completed in one year or less. Communication students are encouraged to look into any of the nine recommended professional resources and associations including the International Communication Association and Communication Currents for networking and academic advancement. Mississippi College is a Christian university that offers several online options for students looking to earn a master’s degree in communications. Graduates from any of the degrees available improve their marketability in today’s competitive workforce. Students study the history and foundation of communication and media while they put their findings to practice in real-world environments. In addition to online program offerings, students can also attend class on campus in the evenings. The college started as Hampstead Academy in 1826. At the University of Memphis, students pursuing their master’s in communication studies degree will receive a comprehensive blend of modern and traditional theories, research, and applicable information to advance their understanding of the field. In order to assist students to reach their professional and personal goals, UM provides various financial relief program including financial aid, scholarships and monetary awards for academic excellence, and financial support for professional conference attendance. The school also offers academic and personal support services at the Center for Academic Retention and Enrichment Services to improve student’s well-being. With so many online master's in communication programs offered, finding the one that fits a student's personal criteria can be tough. This search tool can help by allowing students to choose schools based on population, school type and location. The online master's in communication degree is designed for those who want to hone their skills in one particular area of communications or already have a strong background in journalism, English and the like, and want to shift gears a bit to enter a communications career. Depending on the school, the master's degree typically takes between one and two years to complete. Those who choose to attend school part-time might take up to three years to complete the coursework. But before the work begins, the application process must be conquered. The master’s program is rigorous, and schools expect to see many qualified applicants, so it’s important to work hard and stand out from the pack. The following requirements are necessary to create a stellar application. A bachelor’s degree is the absolute prerequisite for the master’s program in communications. In addition, some schools require students to earn a minimum GPA during their undergraduate education, as well as complete certain courses, such as Public Speaking, Advanced English or Communication, that will serve them well during the pursuit of the master’s degree. The proof can be submitted through official transcripts. Some schools will allow students to send the transcripts themselves, while others might require the transcripts to be sent electronically from the awarding institution. Many schools will give more weight to the application of someone who has pursued a career in a communications field; the resume will provide evidence of that experience, through formal employment, internship or volunteer work. Be sure to include specific details on any job that relates in any way, to communications. Why communications? A strong statement of purpose explaining why this particular field is the ultimate goal can help a student stand out from the competitive pack of applicants. Show how communications is already a big part of the career plan, as well as how the master’s degree is a necessary step in order to achieve the dreams of working in the communications field. Recommendations from employers, coworkers, former professors, and others who can verify academic and professional accomplishments are a vitally important part of the application. Some schools will require students to obtain letters of recommendation themselves, while others will simply require the student to provide contact information, which will then be used by the school to reach out to these contacts on the student’s behalf. Many schools require GRE scores for communications majors. This requirement might be waived if the student has met a certain minimum GPA in their undergraduate work, especially courses that pertain to communication, or has at least five years of proven work experience in a related profession. Since GRE scores might take several weeks to get to the admissions office, it is important to take the test early so as to not miss important application deadlines. The application must be submitted by the deadline, along with the application fee. Some schools have a rolling application process, which means students can submit their application anytime throughout the year. It’s important to remember, however, that GRE scores, recommendations and other documents must be dated within a certain time frame relevant to the application. Prompt submission matters, so documents need to be current. For example, send GRE scores within six months of the date, and recommendations within three months. Online education is made possible through an internet connection, the right software and proper hardware. Ensuring a computer system is up-to-date and capable of handling the workload is a very important part of starting any online degree. Look at the requirements listed for online students on the school’s website, and ensure that all computers used for the program are up to par. If not, now is the time to upgrade, before the first class begins. During the first year of a master’s in communication program, students will brush up on the skills they learned while earning their bachelor’s degrees, as well as hone new ones that they can use immediately in the field. The following are important milestones that can be expected for communications students. The world of communications offers numerous concentrations, including public and media relations, political communication, health communication, applied research, digital communication and non-profit work. The first year will introduce the student to the concentration with in-depth core classes that set the foundation for further learning. For those who took time away from school after earning a bachelor’s degree, this essential overview of previous concepts can serve as a nice refresher course, and helps the student see areas of their current work where those concepts might apply. These required courses will also delve into research and writing skills that must be top-notch for serious communication students. Now is the time to put those hard-earned research skills to good use. During the first year of the program, students will be expected to choose their thesis topic or begin their work on a capstone project. These projects require a large time commitment and will involve in-depth research and writing on a unique topic that closely relates to the communication field. The second year dives deeper into the concentration, allowing students an opportunity to pepper their curriculum with electives that further enhance what they want to learn from their education. Now is the time when students are truly putting their writing and research skills to the test, as well as using their newfound knowledge as a way to enhance their careers. The second year is usually the final year of study for full-time students, and it’s all about the more specialized core courses that make up the bulk of the concentration. These courses are very focused on the chosen path of the communication professional. For example, those who are interested in political communication will focus on lobbying, spokesperson development, campaign management, polling strategies and other related courses. In addition to studying these subjects in-depth, students will put them into action in their day-to-day jobs. Since most master’s degree students are also full-time or part-time employees, they will be able to take their newfound knowledge to work with them. For example, someone working on a health communication major can begin working with colleagues to create new crisis communication strategies or ensure the old ones are up to par. For many students, those last few months are a mad scramble of research and writing as the big project finally comes to an end. This might be the capstone project, the thesis or simply preparing for the comprehensive final examination, which depends on what the school decides as the best way to prove the amount of knowledge a student has learned and retained. By the time the second year ends, communication students usually have a very good idea of what they want to do with their new degree. This is the time to plan out the future by applying for various jobs in the communication field, taking on extra projects at work to set the stage for a promotion or rehearsing the best way to present a raise request to the boss. Completing the coursework is not enough; most schools require that it be completed with a minimum grade. Though a 3.0 is the common requirement, it depends on the school, and in some cases, the program itself. The most important part will be the core courses; which are almost always required to be completed with a higher GPA than other courses. Many online master’s in communication programs require a thesis to wrap up the educational experience. The thesis will focus on a unique question or situation in the world of communication. For example, someone interested in media and public relations might look toward questions of how social media affects how news travels, while those in political communication might explore new ways of polling potential voters. Rather than expecting a thesis, some schools require a capstone project. This is essentially the same process as the thesis, as heavy research and writing will be required. However, the capstone might go further by requiring hands-on work by the student. As an example, those in broadcast communications might try different types of reporting and then poll audiences to determine how the reporting worked in getting their attention. Some schools might also require a final examination. This comprehensive exam focuses on all the points students are expected to learn during the master’s in communication program, and proves that students know how to apply that knowledge to practical applications. The examination will cover many of the core concepts of the concentration as well as communication in general. Students will not only learn about the essential knowledge and theories of communication, but will be able to translate them into practical applications on the job. Knowledge can be seen in action when graduates work political campaigns, educate the public on health topics, work in public relations departments, join a broadcast team or work to get their message out on digital media. The skills a communication graduate learns during the master's program will definitely come into play in their job; common skills include analyzing an issue from all sides, appropriately conveying information to select audiences, researching pertinent issues, writing succinct reports, and creating and implementing new strategies that enhance the public, organization or individual experience. One of the most important skills to take away from a master's in communication education is the ability to think critically about current issues and solve problems, whether long-term or short-term, with solutions that will foster true change over time. In the world of communication, those skills can translate into a wide variety of jobs, including campaign managers, public relations specialists, health advocates, digital media specialists and researchers. Being a good researcher is another important skill that will carry a communications graduate through their lifelong career. Researching the current issues, as well as understanding the historical context, is a vital component of creating new approaches in the communications world. From researching how individuals get their news to analyzing how communication between teachers and parents affects the way students learn, there is no limit to the possibilities that come with top-notch research in this field. Many positions in communications require a bachelor's degree, but a whole new world of opportunity opens up with a master's degree. Those with a master's in communication degree are trained to take on more responsibility, move into management positions and advance in their current career path or even dive into something new. The following jobs are just a few of the many possibilities available to those who graduate from online master's in communication programs. These managers work with community associations to manage the daily affairs of a group of homeowners. The daily work might include collecting fees, negotiating with a contractor, resolving complaints, supervising regular maintenance or helping homeowners ensure compliance with rules and regulations. These very specialized public relations specialists work closely with government entities and lawmakers in the hopes of garnering advantageous legislation for their clients. Lobbyists research regulatory proposals, monitor governmental issues, meet with top lawmakers or their staff, attend hearings, work with other public relations professionals to educate the public and work in concert with lawmakers to develop effective policy strategy. Campaign managers work closely with political candidates and their extended team on such things as creating a campaign platform, raising funds to run an election campaign, educating the public on the candidate, managing the campaign budget, advertising and conducting polls. Campaign managers are the behind-the-scenes experts that help ensure a campaign runs smoothly and effectively. Students and professionals in the communications field can benefit from numerous professional associations, networking options and job resources. The following resources are designed to help those in the field of communications, no matter what their concentration and ultimate career goals might be. The AWC focuses on females in communications, offering awards, job boards, pertinent events and other perks that help women advance, network and earn recognition for their work. This comprehensive website offers numerous resources for students in various communication disciplines, including speech, public speaking, mass communication, broadcasting and more. Designed for professionals in business communication, the IABC offers education, certification, resources, certification, online magazines and an international conference. The NCA works to advance the communications disciplines and promotes appreciation of the need for communications in everyday life. Members can take advantage of teaching and learning resources, career advice and more. Students in various communications disciplines can take advantage of the events, scholarships, competitions, and other resources offered by PRSSA.